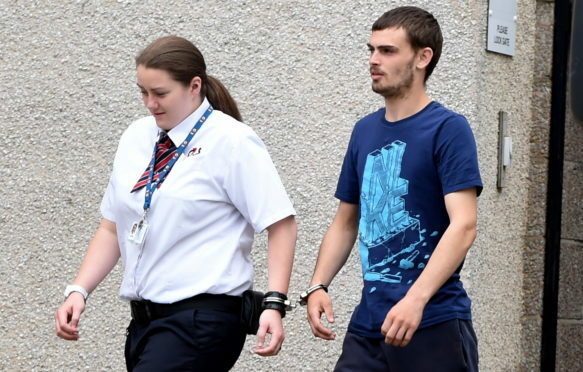 Jay Balgowan and accomplice Michael Smith targeted the Royal Bank of Scotland branch on the city’s Albyn Place by clambering onto the roof and hacking away at it until he gained entry. Once inside, however, the hapless fair found themselves confined within a locked cage with an alarm sounding. They clambered back through the ceiling and made a run for it but were swiftly captured by the police. Smith was detained as he fled and was jailed for 20 months earlier this year for his involvement in the incident. Aberdeen Sheriff Court heard Balgowan – who appeared for sentencing yesterday – had been picked-up a short time later. Fiscal depute Alan Townsend said the 22-year-old had denied being involved and told officers he did not know Michael Smith. He initially claimed to have been at a girlfriend’s house when the raid – which caused £4,000 damage to the bank’s roof – at the time of the break-in, but later confessed his guilt, admitting that, while acting with another, he had broken into the RBS branch with intent to steal. During Smith’s appearance at court, he claimed his then unnamed accomplice had picked the premises to target in what was said to have been a spur-of-the-moment crime. Yesterday, however, defence agent Paul Barnett claimed Balgowan had been unaware what the building was. The court previously heard claims the pair had believed they were on the roof of a garage. “It wasn’t until he was inside the premises that they realised where they were,” the agent said. Mr Barnett urged the court to believe his client’s version of events as he was younger and had far fewer previous convictions. Imposing a sentence, however, Sheriff William Summers said: “You pleaded guilty some weeks ago to a single charge of housebreaking with intent to steal. “I recognise that you appear before the court with a limited record of previous offending but I need to have regard for the gravity of this offence. “You say you did know it was a bank and I am prepared to accept that. He jailed Balgowan, of Waulkmill Crescent in Aberdeen, for 15 months.